Couscous isn’t just easy to cook, it also pairs beautifully with soups, salads and even desserts. 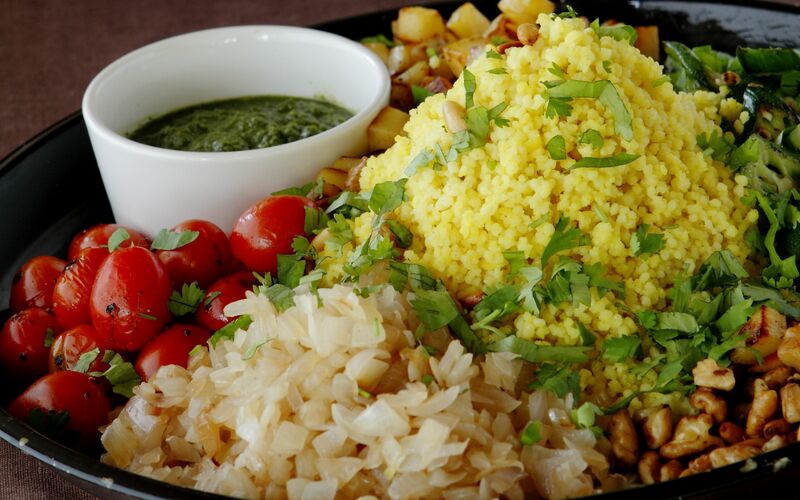 Enjoy this combination of couscous with a side of sambal and mint chutney. Pour the couscous into a mixing bowl and add the salt and olive oil. Mix well, then add the turmeric and mix again. Bring the coconut milk to a slow boil and pour over the couscous; give the bowl a little shake and set aside to allow the milk to be absorbed. In a frying pan, heat 1-2 tablespoons of oil. When hot, add the potatoes and cook over medium heat until golden brown on all sides. Season to taste with salt and pepper. In the same pan, add a bit of oil and sauté the onion and garlic 4-5 minutes until the onion is translucent. In the same pan, add a bit of oil and sauté the okra until just cooked – it must still have some crunch. Toss the couscous with the rest of the ingredients in a large mixing bowl and serve, garnished with coriander, with the sambal and mint chutney. Place all the ingredients in a blender and process on medium speed to the desired consistency. Cover and set aside for a few minutes to allow flavours to mingle. Place the chillies, shallots, onion, ginger, galangal and garlic in an electric blender with 1/4 cup water and blend until smooth. Pour chilli paste into a wok and cook for 5-10 minutes over medium heat until slightly dry. Add oil and cook, stirring over low heat, for 30-40 minutes until oil surfaces. Add the tamarind juice, sugar, and salt, and continue stirring for 5-10 minutes. Allow to cool before storing in the fridge for later use.